The Downeast Fisheries Trail presents a rich educational opportunity for local and visiting students. Exploring fisheries heritage means learning about marine science, ecology, culture, history, policy and economics. Families and student groups visiting the Trail can learn about the people that make a living off the sea, and participate in activities that bring local fisheries heritage to life. 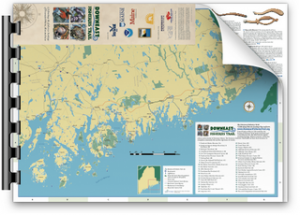 Downeast Fisheries Trail partners intend to reach out to schools and educational institutions to identify places where this project can complement existing curricula at all grade levels. Fisheries heritage-related activities can be taken on the road to festivals and events, and be implemented in schools, at summer camps, and within family and youth programs. Activities might include oral history projects, geo-caching, field studies in marine science, writing, drawing or photography, and other activities that help youth connect to the sea, its fisheries, and the people who depend on them. The Catch is a new, place-based online literary journal featuring works of poetry, fiction, essay and other prose inspired by the fisheries and coastal heritage of Downeast Maine. The Catch is related to the Downeast Fisheries Trail and welcomes submissions of poetry, prose, and fiction from writers of all ages. Visit http://digitalcommons.library.umaine.edu/the_catch/ for more information or to submit.